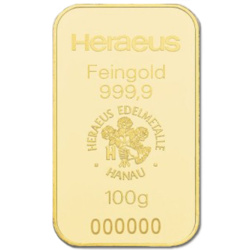 Heraeus is a leading provider of precious metals services and products. Founded in 1851, Heraeus is a globally leading technology group, headquartered in Hanau (Germany). Today, Heraeus focuses on the environmental, energy, electronics, health, mobility and industrial applications sectors. Heraeus combines all activities related to their comprehensive expertise in the precious metals loop – from trading to precious metals products to recycling. Their bars are among the most popular investment products when it comes to investments in physical precious metals. Because of their unique properties, however, precious metals are used in a number of industrial applications. Heraeus is also one of the major recyclers of catalysts containing precious metals worldwide. A new precious metals factory, located at the Nanjing Chemical Industry Park, opened in 2018. It comprises an area of 84,000 m2 and offers extended recycling capabilities. As a major precious metasl services supplier, Heraeus combines state-of-the-art technology, world-class facilities and the industry’s most experienced precious metals experts to give you unrivaled value and service. Heraeus offers top quality products based on many years of experience and technical expertise. 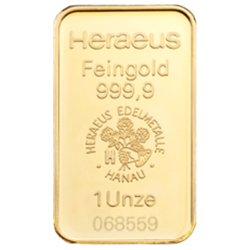 In addition to gold bars, Heraeus manufactures London Good Delivery silver, platinum and palladium bars, alongside an extensive range of smaller bars. With purity at 999.9, their gold and silver bars exceed international standards. Heraeus‘ stringent supply chain policy ensures sourcing of metals from legitimate and ethical sources. Only materials which fulfill high standards are used for the production of bars; this applies to primary supply from mines as well as recycled material. Heraeus has a long-standing accreditation on the LBMA Good Delivery List, but is also a supplier on most physical gold trading centers, such as TOCOM (Tokyo) and COMEX (New York). Heraeus’s environment commitment includes sustainable development programs and reducing Co2 emissions.